Tommy Byrne didn’t really have a nickname but if he did, it probably would have been “Wild Man.” This southpaw had a blazing fastball and a great biting curve but he had a real tough time throwing either of them over the plate with any consistency. Over his thirteen season big league career, the Baltimore native averaged just under seven walks for every nine innings he pitched, led the American League in that department three straight seasons and in one of them, 1951, he walked 150 batters in just 143 innings. And when Byrne didn’t walk a batter, chances were good that he’d hit him instead because the guy led the AL in hit batsmen five different times. So how did a pitcher who was so wild stay in the big leagues? There were two reasons really. The first was that despite his aversion to the strike zone, Byrne would win games. 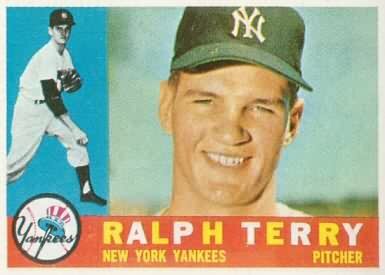 He started pitching full time for the Yankees in 1948 and over the next three seasons his record was 38-21. He was a very effective fourth starter for New York, behind their legendary Raschi, Reynolds, Lopat triumvirate. The second reason the Yankees kept him was his ability to hit. Byrne was one of the best hitting pitchers in all of baseball. He averaged .326 in 1948 and .272 two seasons later. He was such a good stick that he was frequently used as a pinch hitter and actually had 80 pinch hits during his career. So Manager Casey Stengel, Byrne’s Yankee teammates and even most Yankee fans would tolerate the left-handers mind-numbing spurts of wildness because he kept winning games and the team kept winning pennants in spite of them. 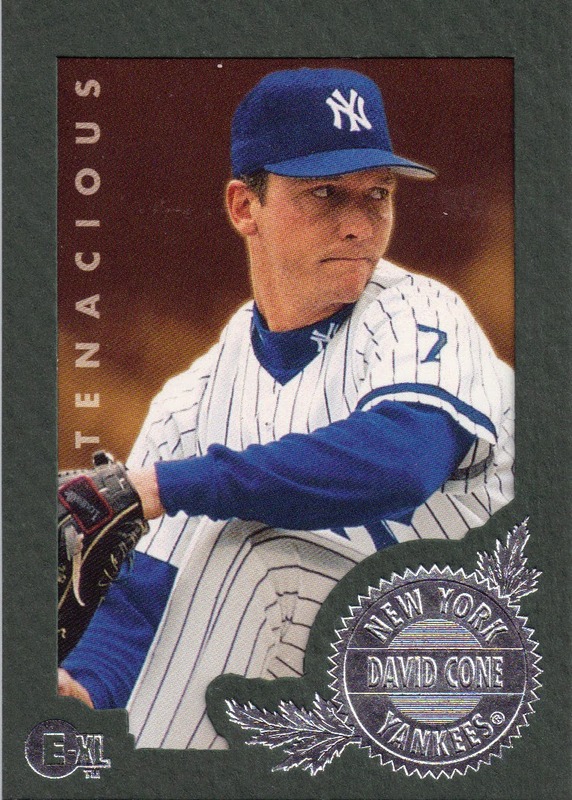 Unfortunately for Byrne, the one guy who couldn’t tolerate it any longer turned out to be Yankee co-owner Dan Topping. On June 15th, 1951, Topping engineered a trade that sent Byrne to the Browns for another southpaw pitcher named Stubby Overmire. I read that Stengel was livid with Topping when he learned of the trade after it had already been consummated. The Yankees didn’t miss Tommy at first because they still had the big three in their starting rotation along with a new young southpaw named Whitey Ford. Byrne, on the other hand did not find pitching for the lowly Browns anywhere near as enjoyable as pitching for the mighty Yankees. He went 11-24 during his two seasons in St. Louis and then was traded to the White Sox. In addition to being wild, Byrne turned out to be pretty lucky too. By 1954, Raschi was gone and Reynolds and Lopat were nearing the end of their careers. Byrne in the mean time, had been sold by the White Sox to the Senators and then released. He spent most of the 1954 season pitching for Seattle in the PCL League, where he went 20-10 on the mound and hit .296 at the plate. That performance caught the attention of the Yankees and the then-34-year-old pitcher suddenly found himself back in pinstripes at the close of the 1954 season. 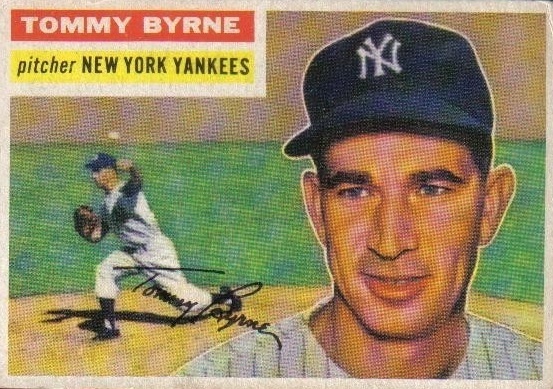 The following year, Byrne rejoined the Yankees’ starting rotation and went 16-5 to lead the AL in winning percentage. He also pitched very well in the 1955 World Series against the Dodgers. Bryne got a complete-game 4-2 victory in Game 2 and also drove in the winning runs with his two-run single. He then held the Dodgers to just one run for five-plus innings of Game 7 before being lifted by Stengel in a game the Yankees would go on to lose. Byrne pitched two more seasons for New York and then went back to college at Wake Forest. He ended his career with an 85-69 overall record and 72-40 as an eleven-year Yankee. He ended up getting into politics and served as Mayor of the college town for fifteen years. He passed away in 2007, at the age of 87. One of the things I learned about Byrne doing research for this post was that he was considered to be a flake. He was known for talking to opposing hitters during the game and according to Yogi Berra, Byrne’s chit chatting would drive all stars like Ted Williams and Al Rosen absolutely crazy. Often times, he would tell the hitter what pitch he was about to throw. The talking combined with his sharp biting curve ball and lack of control made Byrne Yogi’s choice as the toughest pitcher he ever had to catch. Byrne shares his last-day-of-the-year birthday with this other former Yankee starting pitcher. 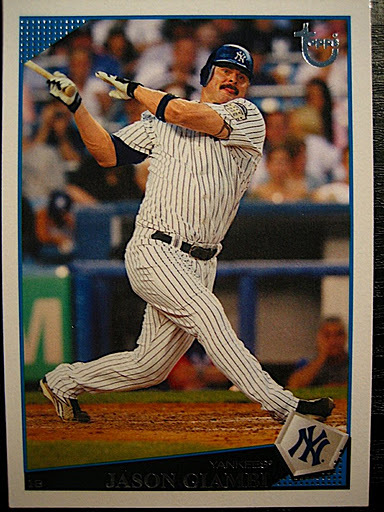 Tino Martinez was a great Yankee. During his seven seasons in New York, this Tampa native who was born in 1967, drove in 739 runs, hit 192 of his 339 career home runs and won four World Series rings. He also happened to be my wife’s all-time favorite baseball player. 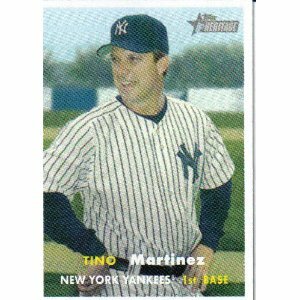 So instead of spending the rest of this post describing the biggest highlights of Tino’s career in pinstripes, I’m going to tell you a story about how my wife met Tino Martinez. It happened in my Oldsmobile Minivan outside of Yankee Stadium, about ten years ago and to those of you with your minds in the gutter, it was not “that” type of meeting. My wife and I had taken our kids to a Yankee Game. As we were leaving the Stadium parking garage I was trying to maneuver the van into a certain exit line so I could take a simple right-hand turn and get onto the Major Deegan Expressway heading north toward home. I had driven to Yankee games at least forty times in my life and had parked in that same garage most of those times. From experience I knew if I used any other exit, barricades would block me from taking a right turn and force me to go left which meant I’d have to spend the next two hours riding through the unfamiliar streets of the South Bronx to get back on the Deegan going in the right direction. That’s when my wife uttered her famous phrase. “Why are we waiting in this long line? There’s no cars over at that exit why don’t we just go out there?” My immediate reaction was to ignore the question and simply hope she wouldn’t ask it again. No such luck. I don’t remember if it was the third or fourth time she repeated her inquiry that I patiently tried to explain that the reason there were no cars at the other exit was because you couldn’t take a right-hand turn from that location. I tried to point out that every driver in the fifty or so cars in front of us and the one hundred or so vehicles behind us knew that if you took a left instead of a right from this side of the parking garage you would spend the next five hours driving underneath elevated subway platforms and past six thousand auto body shops with pit bulls chained to razor-wire-topped chain link fences, as you cruised aimlessly through South Bronx looking for the one and only sign in the entire borough that directs you to the Deegan North.Her response? “That’s stupid. I’m sure you can take a right from that exit too. Just go that way. We are going to be stuck in this line forever. I’d go that way if I were driving.”So what did I do? I gave up my place in line and drove to the other exit and sure enough as we drove through the gate the familiar wooden blue NYPD barricades blocked me from taking the right I needed to make and forced me left. Why did I listen to my wife? Forgive my chauvinism but I know there are many married male readers out there who follow the same rule I do while driving in heavy traffic. If there’s a choice between doing something you know is stupid or not doing it and then getting in an argument with your wife over it, you just follow her stupid advice. Why? Because in the long run, spending two hours lost in the Bronx was better than spending the rest of the ride home and at least the next five days living with a woman who is mad at you for not taking her bad advice. She was actually standing on the front seat of our minivan and had somehow gotten the entire top three quarters of her body out of the passenger side window yelling as loudly as possible and waving her arms and hands frantically. I had never in my life seen a human being get so excited about seeing a baseball player and evidently, neither had Tino and the rest of the Yankees. My better half (or I should say three quarters of my better half) was making such a commotion that Constantino “Tino” Martinez actually opened his passenger window, laughing at my wife’s enthusiasm, and yelled hello and waved to her. As the bus began to move, me and the kids were able to successfully pull my wife’s contorted body out of the window and get her buckled back into her seat. As we made our way back up the New York State Thruway that evening and I listened to my wife and kids talk and laugh about our encounter with the Yankee player’s bus, I was glad I took that stupid left instead of waiting in line to make my usual right. Today is also the birthday of this six-time Gold Glove winner and these two former Yankee outfielders who all played their best baseball before they put on the pinstripes. 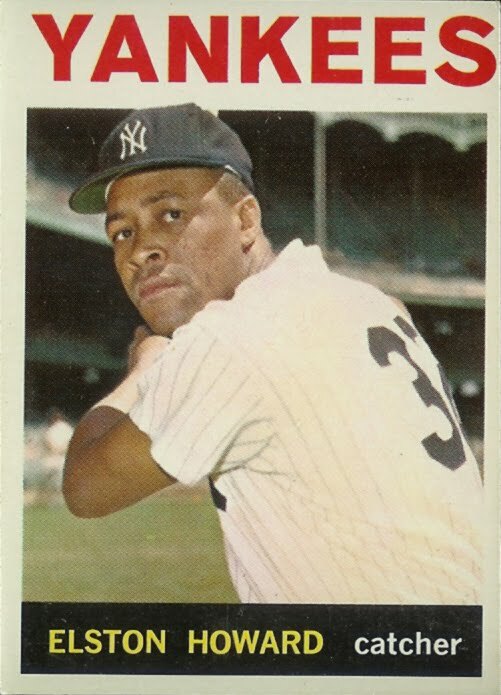 I was a huge Elston Howard fan when I was a kid. He never seemed to get the amount of media attention accorded to his more famous Yankee teammates but he certainly got the attention of Yankee opponents. In 1961 he hit .348, a ridiculously high average for an everyday big league catcher. In 1962 he drove in 91 runs from the six-hole of the Yankee lineup. In 1963, he was selected the AL MVP and in 1964 he played in 150 games, hit .313 and was named to his seventh consecutive AL All Star team. The Yankees were slow to integrate their team, waiting till 1956 to do it with Howard, who by then was already 26 years old. Compounding Ellie’s delayed development was a Yankee roster loaded with talent and his first Yankee manager, Casey Stengel’s platoon system, which combined to relegate Howard to less than 375 at bats in five of his first six big league seasons. It wasn’t until Ralph Houk replaced Stengel in 1961 that Howard became a full-time part of the Yankee lineup and by then, he was already 32 years old. Give him those 450 at bat seasons beginning when he was 22 or 23 and Howard would have hit closer to 300 lifetime home runs instead of 167, he’d have easily added perhaps 700 more hits to his career total of 1,471, he’d have seven world series rings instead of four and perhaps he’d be in Cooperstown today. 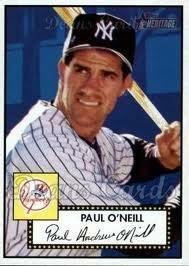 This former Yankee outfielder and this one too, also celebrate birthdays on today’s date.